Classes are an important part of most role-playing game and also in Xenoblade Chronicles X you can choose between different character types. 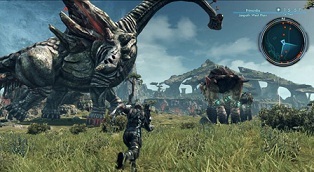 However, the new open-world role-playing game from Monolith Soft, differs somewhat from other genre representatives, because you don’t only collect the classic experience points to build the main character but also there are three different systems, each with its own level of experience points. With them you can improve your hero. Experience Points (EXP): The classic XP, which is available in almost every other RPGs in a similar form. You can get them by wining battles and discovering new areas. With XP it increases the level, the basic attributes and the life energy. Class Points: With these points you can advance your chosen category and get you new talent for the combat system. You will receive these points by wining battles. Division Points: Once you have joined BLADE, you get gradually Division points with which you can increase mechanics, biology and archeology skills. At the beginning of Xenoblade Chronicles X you close to one of the 8 divisions of BLADE. Here you collect gradually Division points with which you increase your BLADE levels and increase the following skills while exploring NPC Eleonora: mechanics, biology and archeology. Each blade level you get a point which you can distribute to the three Skills. When you reach again 10 levels in one of these classes, you can you choose between two specializations. And again you can specialize after 10 further levels and so on. Which class is the best? - For beginners, the specialization Commando with the outgoing class Samurai Gunner is recommended, since you get a good mix of offensive and defensive fighting techniques. - There is no "best" or "bad" class, all have their own merits. - You can always change class and new specializations classes - once invested points do not expire, then you can experiment freely. - Whether you can continue to use a technique also depends on the weapon because the classes are using their own weapons. However, there are overlaps or techniques that are not tied to a specific type of weapon - these techniques you can continue to use regardless of the selected class. - If you choose a completely new class (no further specialization), you have usually much less techniques than before, so don’t change from difficult story missions or boss battles.